Available for $2.99 from most popular e-book vendors, including amazon.com, bn.com, kobobooks.com, and iTunes. Henry Hastings Sibley was treaty negotiator, state governor, and military leader, and his life intersected with the many complexities and crises of nineteenth-century America, including the U.S.–Dakota War of 1862. Rhoda R. Gilman, who exhaustively researched Sibley’s life, outlines the events and actions leading up to and following the war, and Sibley’s role in it. This e-book short highlights the rifts and crises leading up to the U.S.-Dakota War in Minnesota between the Dakota people and the U.S. government, as keenly represented by then governor and later brigadier general, Henry Sibley. Excerpted from the book, Henry Hastings Sibley: Divided Heart. Rhoda Gilman is also the author of Stand Up! The Story of Minnesota’s Protest Tradition and a founding member of Women Historians of the Midwest and a former candidate for lieutenant governor of Minnesota on the Green Party ticket. 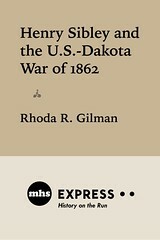 Henry Sibley and the U.S.-Dakota War of 1862 is the is the second release from MHS Express, the new digital imprint from the Minnesota Historical Society Press (MHS Press) of short-form e-books. Be they essays from published works or forthcoming titles or original pieces, MHS Express e-books present quick reads on relevant and compelling topics.